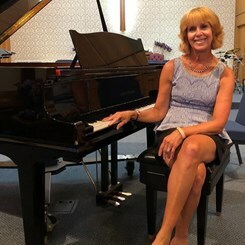 Hello, my name is Lynne Kaspin and I joined Music & Arts in Marlton, NJ, as a piano teacher 15 years ago, in October of 2003. I have been playing the piano since the age of five (1964) and have been teaching for over 21 years. In addition to teaching at Music and Arts, I've also taught in Center City, Philadelphia, and in the local Marlton community at peoples' homes, in my own home, and I have also taught group piano classes in my hometown. I have taught students as young as children who have just turned four years old, but I teach any age and level, from early childhood through adult. Every year, in the spring or summer, I have a student recital, followed by a reception. This event is held at my church in Merchantville, NJ, due to space limitations at the store. At Music and Arts, we also have a winter piano concert in December. I graduated in 1981 from Elizabethtown College in Elzabethtown, PA, with a Bachelor of Science Degree in Music Therapy // Piano Concentration. My favorite music style on piano is classical music. However, I teach any style of music, always finding out what the student is interested in learning, and focusing on that, once the basics are learned. The piano methods books that I use the most often are Bastien, Alfred and Faber. In addition to piano, I also enjoy playing the flute on a beginner/intermediate level. Request Lessons with Lynne today!